I wonder how many fires were started as a result of broken candle holders. 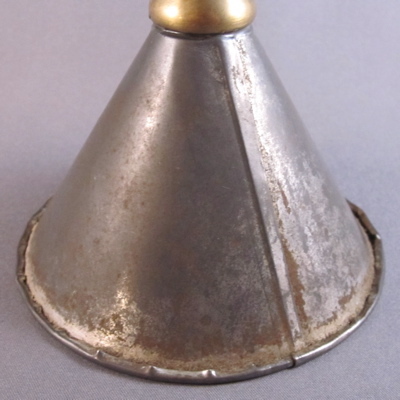 I have come across many examples with unusual replacement bases, including metal funnels, coconut shells, and blocks of wood. 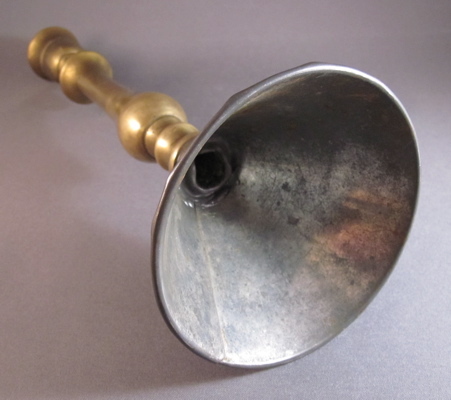 This is not surprising, as candleholders were handled everyday by various household members in every room of the house. 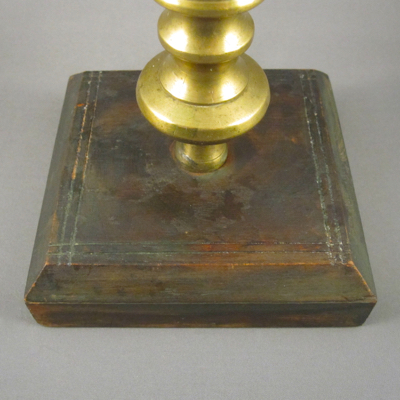 This candle holder was made in England in the late 1800s. It stands 7.5 inches high. 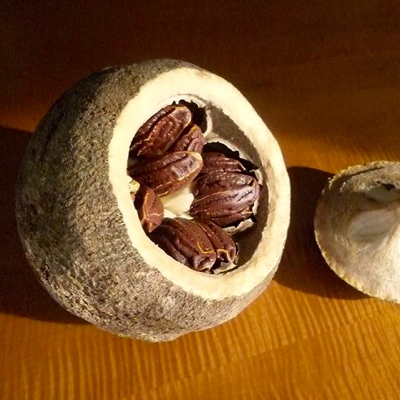 Most likely it was one of a pair that might have been separated from its “perfect” mate. 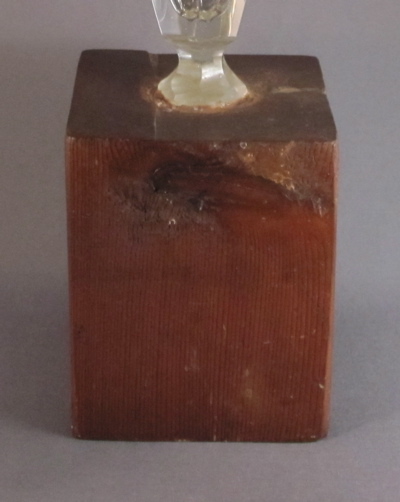 After the original brass base became detached from the stem, an overscaled wood replacement was fashioned. 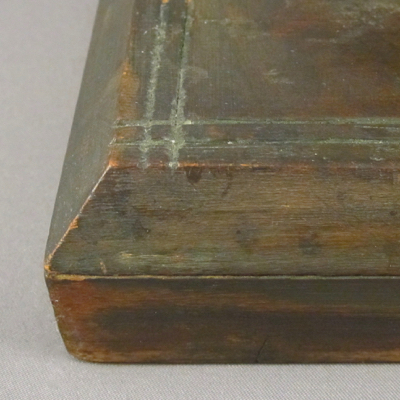 This well made base, complete with beveled edges and cut-line detailing along the top, measures 5 x 5 inches and appears to be a homemade make-do. What ever happened to the matching candle holder without repair, you may ask? The story of The Prince and the Pauper comes to mind, so I imagine it has spent the past 130+ years in a castle, polished within an inch of its life, sitting prominently on a large sideboard and hobnobbing with other “perfect” things. 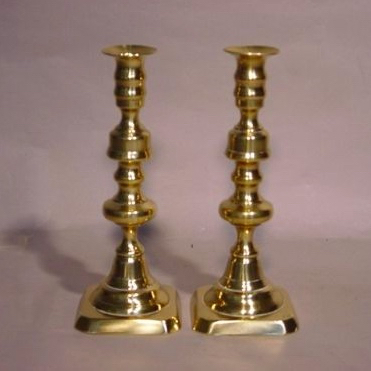 This pair of candlesticks suggests what the original octagonal base on mine might have looked like. 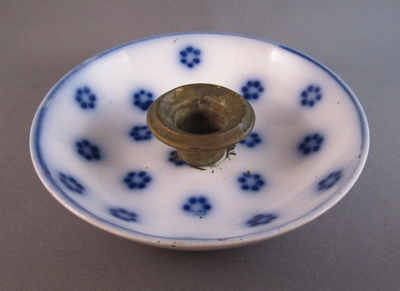 When the stem and base of a 19th century metal candle stick became damaged, someone took the surviving bowl and attached it to a simple ceramic pearlware dish with sponged “flow blue” decoration. 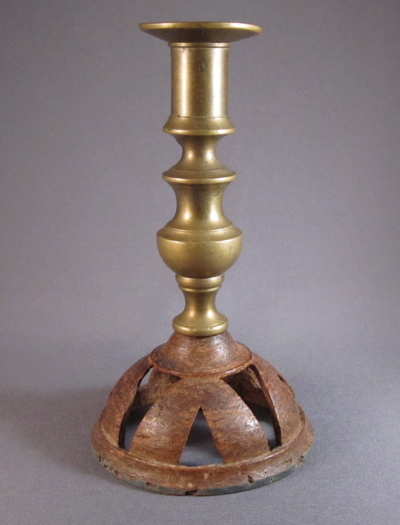 The result of that marriage is this more practical candle holder, which measures 5-7/8″ in diameter. 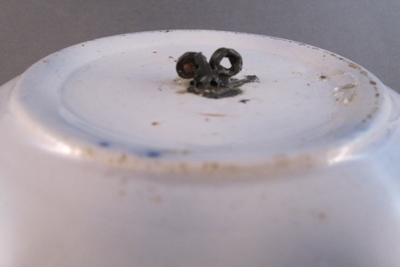 The metal bowl was attached to the dish using a short screw and early butterfly nut. Due to the nut’s protrusion through the bottom, the candle holder does not sit well on a surface and makes for a less than ideal (and somewhat dangerous) candle holder. 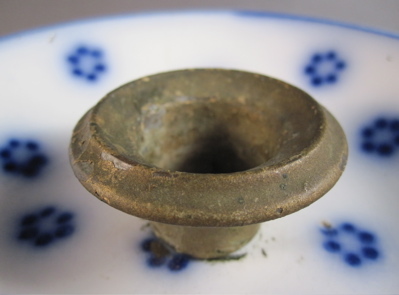 A surprising blend of cultures merge when this English cast brass candlestick was attached to a carved Brazil nut pod, after the brass base broke off. 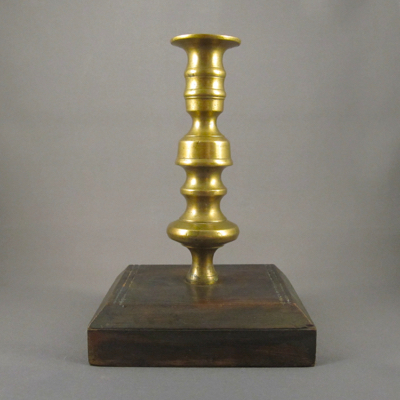 Candle holder with replacement base stands 6.75 inches tall and the repair was most likely done in South America in the early 1900s. 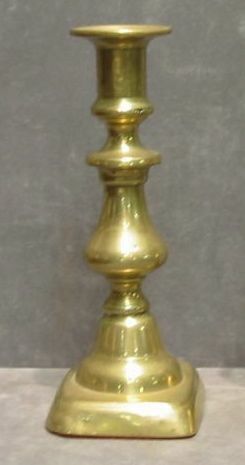 This typical brass candle holder shows what the original base might have looked like. 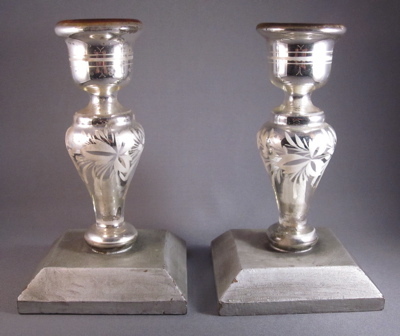 Pair of candle holders with mercury-filled double-walled glass and cold painted with white enamel floral decoration. 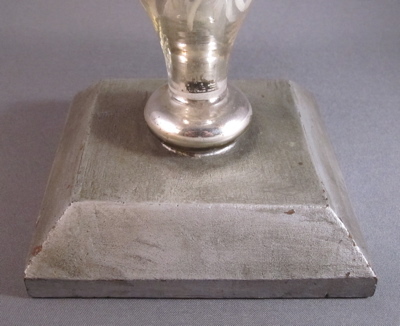 Mercury glass was first patented in 1849 in England, where it was often referred to as “poor man’s silver”. 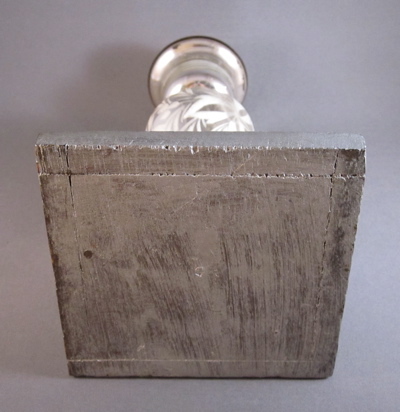 I have never seen another example of mercury glass with an inventive repair. 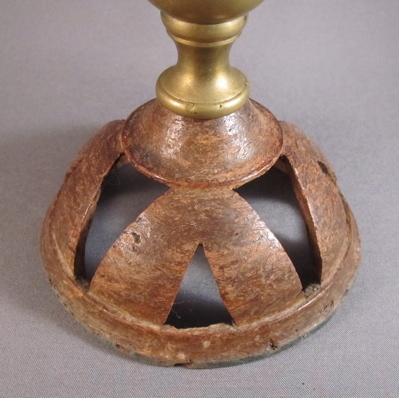 Someone did a fine repair job outfitting these broken candle holders, each measuring 6-3/4″ high, with silver painted wood bases. The pair of bases are nicely painted, even on the bottoms. 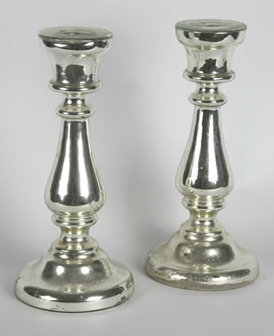 Intact bases are shown below on this similar pair of 19th century French candlesticks. 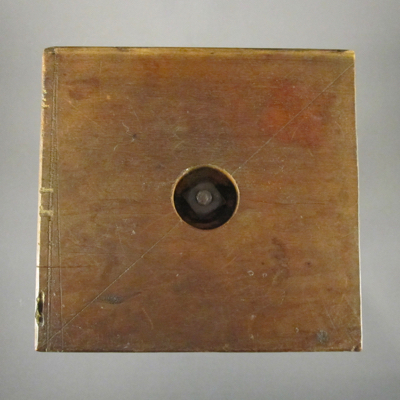 One of my favorite antiques with inventive repairs illustrates the incongruence of materials and the immediate need to mend a broken item. 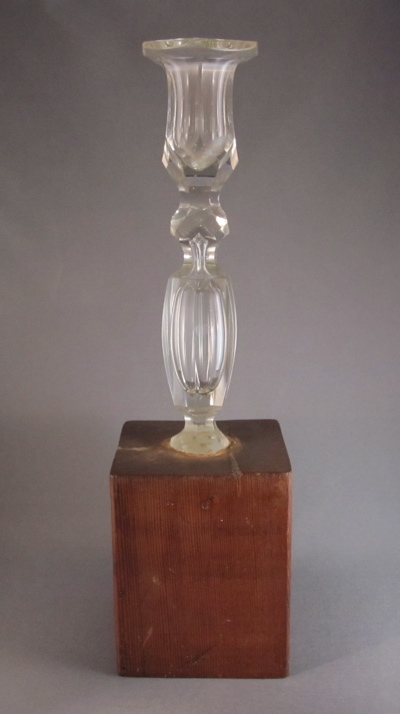 When this elegant American flint glass candlestick snapped off at the base, it was attached to a simple 3-1/2″ solid block of mahogany. 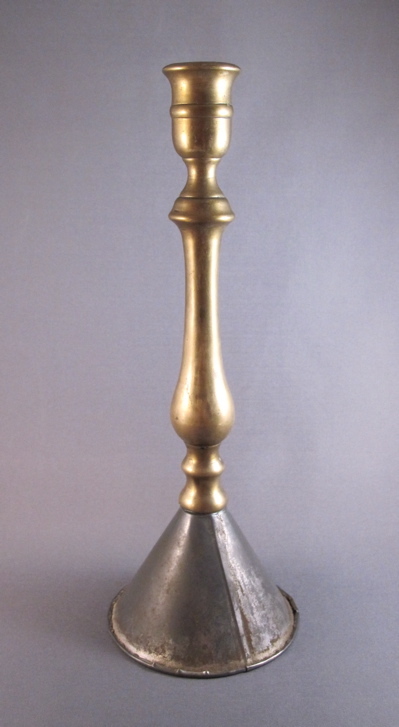 Candlestick with replaced wood base measures 12-1/2” high. 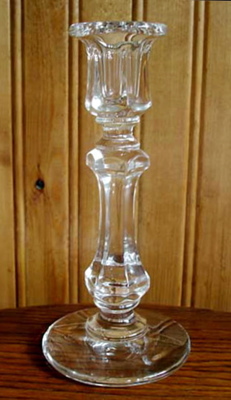 A similar flint glass candlestick, showing a standard round base.